If you made it to this page, you likely are already familiar with FOCUS–that is, you know generally about the mission and work of the organization (if this isn’t the case, feel free to check out our “About” page for some basic information). However, without spending a lot of time at FOCUS Center, it can be hard to have a clear picture of our work and the ethos that undergirds it. This blog series, “A Day in the Life,” is meant to give you a window into the “What’s” and “Why’s” of FOCUS. 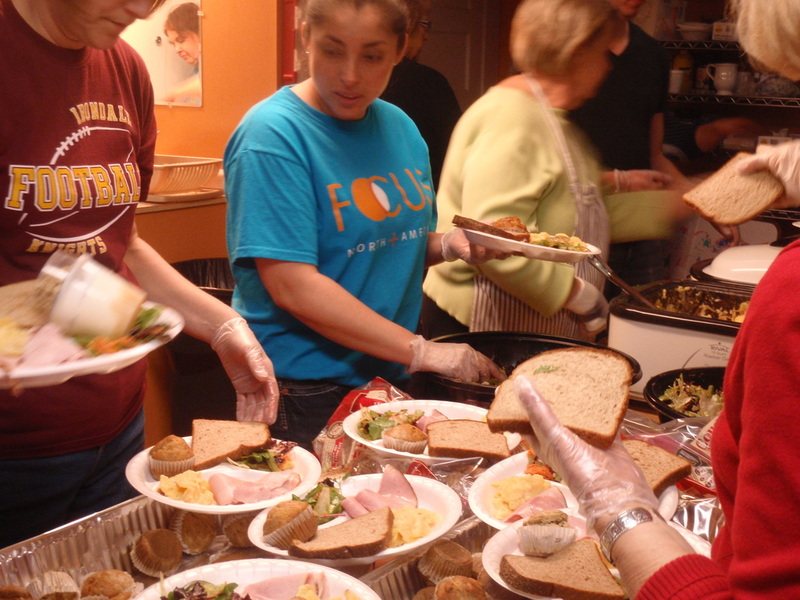 When I think of describing Sunday Night Dinners at FOCUS, the word, “mercy,” is the first that comes to my mind. Mercy is of course, at the core of FOCUS’ mission, but I think it characterizes our weekly community meal in a special sort of way. There is no registration process for Sunday Dinners. There is no upper limit on how many members of your family you can bring, or how often per month you can come. You don’t have to bring an I.D. or proof of address. Anyone can show up for a hot meal and a warm space, no questions asked. The logistics of Sunday Dinners really start today. I stop in at the Center, touch base with Vera, our Director, and check the supply closet to make sure we’re stocked up on paper products and silverware. I also check the calendar to confirm who will be bringing the meal and helping to serve it. We are blessed to have a schedule of regular groups from local parishes, youth sports teams, and other volunteers. This week in particular, a youth group from an Orthodox Parish is scheduled to serve. I pull up to FOCUS, a few minutes early…and am greeted by a small assembly of people already waiting to be let in: the catering team from the youth group is already here! So are John* and Alex*, our former-clients-turned-volunteers. They used to come every week to eat dinner. Now they come to serve, one acting as an informal DJ by providing ambient music, the other helping wait tables. 40 minutes until we open for guests and set-up is already in fully swing. FOCUS’ large multipurpose room has been transformed into a dining room, complete with table clothes, plastic ware and condiments at each place, and ambient music in the background. These words articulate why we are all really here tonight. It’s not about how meany meals we serve. It’s not about who the guests are or hardships they may or may not face. 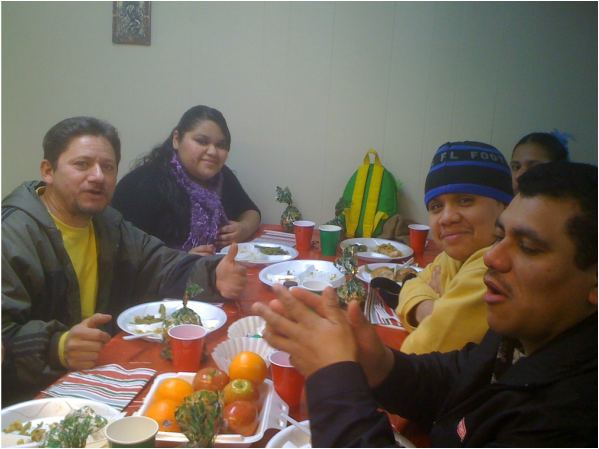 It’s not even just about giving a meaningful volunteer experience to the group who brought the meal. It’s about doing what we can to provide a bit of kindness to those who come to us. As we break up the prayer circle and take our stations, the dining room starts to fill. Families. Single adults. Children of various ages. Troops of 4 or 5 friends who came together. The dining room starts to hum with activity. As guests are seated, volunteers offer them something to drink before bringing them a plate from the kitchen. No buffet lines here. We want the guests to feel as if they’re in a restaurant. We want their time to be restful. By now, the evening is wrapping up. The youth are busily breaking down tables and taking out the trash. Most of our guests have left by now–most stopping to say “thank you’s” and “goodnight’s,” others simply shuffling out the door. A few stragglers are still finishing up. A volunteer greets her and guides her to one of the remaining tables, where we quickly bring her a plate of hot food. Someone sits down with her as she eats. She’s upset, crying quietly over her food, mumbling to herself. Though she tells us very little about her circumstances, it’s clear she’s struggling. And in this particular space, at this particular time, with so little information, there’s not much we can really do that will offer a permanent “fix” for whatever situation she’s in. But was can offer a hot meal. We can offer her information about shelters nearby and offer to call them for her. We can offer a new coat out of our clothes closet to replace the one she’s wearing that won’t zip. We can encourage her to come back next week, for the foodshelf on Wednesday, for the clothes distribution on Friday. Most importantly, we can offer a listening ear, some kindness, and a safe space, if only for a little while.